Add gorgeous style to your bedroom decor and comfort to your Bedding with our Bare Bottom Sheets - All Season - White. Add gorgeous style to your bedroom decor and comfort to your Bedding with our Bare Bottom Sheets - All Season - Tundra Gray. Add gorgeous style to your bedroom decor and comfort to your Bedding with our Bare Bottom Sheets - All Season - Nightfall Navy. Add gorgeous style to your bedroom decor and comfort to your Bedding with our Bare Bottom Sheets - All Season - Glacier Gray. Add gorgeous style to your bedroom decor and comfort to your Bedding with our Bare Bottom Sheets - All Season - Dewkist. Add gorgeous style to your bedroom decor and comfort to your Bedding with our Bare Bottom Sheets - All Season - Black. Add gorgeous style to your bedroom decor and comfort to your Bedding with our Bare Bottom Sheets - All Season - Almond Milk. Add gorgeous style to your bedroom decor and comfort to your Bedding with our Bare Bottom Sheets - All Season Bedding - Alloy. Add gorgeous style to your bedroom decor and comfort to your Bedding with our Bare Bottom Sheets - Winter Warmth - Gray. Add gorgeous style to your bedroom decor and comfort to your Bedding with our Bare Bottom Sheets - Winter Warmth - SunKiss Cream. Create a luxuriously soft and comfortable sleep environment with our Bare Bottom Duvet Cover - White. 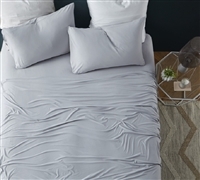 Create a luxuriously soft and comfortable sleep environment with our Bare Bottom Duvet Cover - Glacier Gray. Create a luxuriously soft and comfortable sleep environment with our Bare Bottom Comforter - Bedding Alloy. Create a luxuriously soft and comfortable sleep environment with our Bare Bottom Comforter - Dewkist Bedding. Create a luxuriously soft and comfortable sleep environment with our Bare Bottom Comforter - Bedding White. Create a luxuriously soft and comfortable sleep environment with our Bare Bottom Comforter - Bedding Tundra Gray. Create a luxuriously soft and comfortable sleep environment with our Bare Bottom Comforter - Oversized Bedding - Nightfall Navy. Create a luxuriously soft and comfortable sleep environment with our Bare Bottom Comforter - Bedding Glacier Gray.